It is a story worthy of great theatre: the bitter rivalry between two women that is tearing apart a country. Sheikh Hasina and Khaleda Zia head the two main political parties of Bangladesh, and have swapped power back and forth for the last 20 years. The relationship between the two “battling begums” has come under international scrutiny recently, after Bangladesh suffered the most violent election in its short history. More than 100 people died during the campaign, with the country disrupted by strikes, blockades, and violent clashes between police and opposition supporters. The controversy started well before the country went to the polls on 5 January. Since 1996, Bangladesh has held elections under a neutral caretaker government. In 2010, Hasina’s Awami League party, buoyed by a strong parliamentary majority, decided to abolish the provision. The opposition, Zia’s Bangladesh Nationalist Party (BNP) took issue with this, saying that a fair election could not be guaranteed without a neutral body overseeing it. The Awami League would not set up a caretaker government. The BNP boycotted the election. Hasina decided to go ahead with the poll. Inevitably, her party – unopposed in 153 of the country’s 300 constituencies – won. But, equally inevitably, the validity of a contest in which there was only one real option has been questioned. The election result was also undermined by an unusually low turnout, with the government putting the figure at under 40 per cent and others reporting far less than that. This was not just to do with voters choosing not to vote, but with a systematic campaign of intimidation and violence by supporters of the opposition BNP. 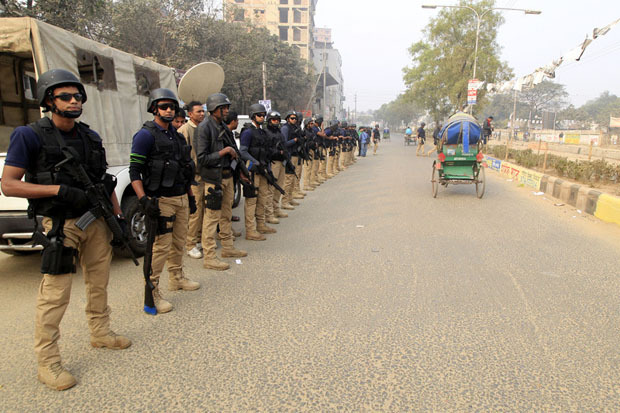 Enforcing blockades, strikes, and boycotts, supporters of the BNP and their allies, the Jamaat-e-Islami, petrol bombed buses carrying workers, and set fire to shops that had opened in defiance of the strikes. Elections in Bangladesh tend to be big public events, with people getting up early to join famously long queues and proudly displaying their ink stained fingers. Yet people in the capital Dhaka during this year’s election described an eerie calm. Voting took place in just nine of 20 seats in the city. There were vicious attacks on the country’s Hindu minority, who make up around 10 per cent of the population and tend to support the Awami League. The election chaos comes after a year of ugly political violence in Bangladesh: around 500 people were killed in political clashes during 2013, making it one of the most violent years since independence in 1971. This began with a mass popular movement against religious fundamentalism. Named the Shahbag movement, after the area of Dhaka where it began, the protests swiftly triggered a backlash from the religious right and their supporters. Much of this polarisation – between secularists and Islamists – had been precipitated by the government’s war crimes tribunal. Prosecuting people for crimes committed during the war of independence in 1971, the tribunal has reopened old tensions. Islamists claim it is being used to shut down the opposition, while secularists argue that the sentences (which include the death penalty) are not harsh enough. Now, several weeks after the election, the political system remains in crisis. Zia is effectively under house arrest, while Hasina’s victory is seen across the board as empty. International and domestic observers alike say that the only way forward is for the two women to sit down together and hammer out a compromise. With early elections expected within the next 18 months, and with political uncertainty and violence continuing, this is ever more pressing. Samira Shackle is a freelance journalist who has reported extensively on religious and social affairs in Britain and Pakistan, for the New Statesman, Prospect, the Guardian, Monocle, and others.